The picturesque Florentine street called Costa San Giorgio, situated in the Oltrarno part of Florence roughly between the River Arno and the Boboli Gardens, begins near the lovely Church of Santa Felicita. If we walk along Costa San Giorgio for about 10 minutes, passing the house at No. 19 where Galileo Galilei lived for several years, we arrive at Porta San Giorgio in Florence, a part of the Florentine past well worth a visit. 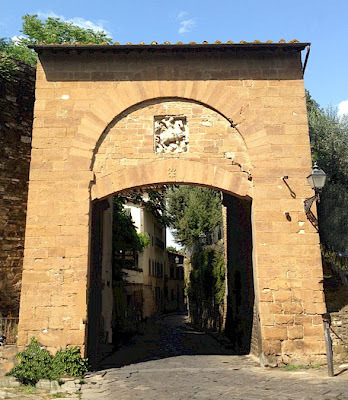 The gate is named after the St. George of dragon fame and, indeed, embedded above the arch of the gate there is a bas relief of St. George slaying the dragon. The original bas relief, now housed in the Palazzo Vecchio, was carved by Andrea Pisano, the best sculptor in Florence at that time and who created the south door of the Baptistry of Florence. The decoration of the gate includes a fine fresco by a Lorenzo di Bicci of a Madonna and Child Enthroned with Saints Leonard and George. If we make allowance for the fact that the gate was lowered in 1529 at the suggestion of Michelangelo because of the siege of Florence at the hands of the imperial army led by Emperor Charles V, the gate is still today in an excellent state of preservation, giving us a very truthful vision of how it appeared 500 years ago. 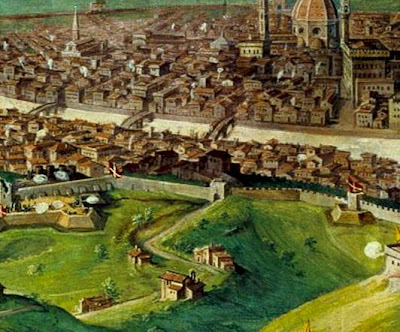 Interestingly, Giovanni Stradano executed a beautiful picture of the siege of 1529, including the Porta San Giorgio, in one of the frescoes that adorn the Sala di Clemente VII in Palazzo Vecchio. 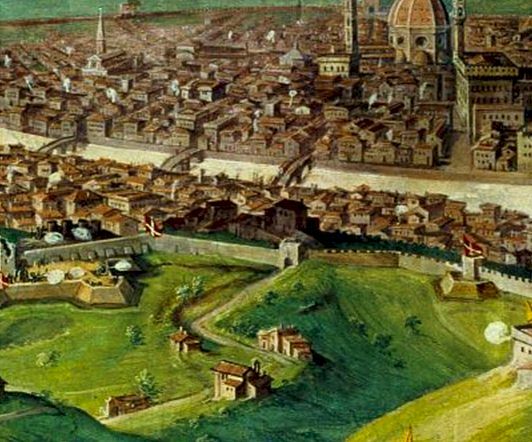 Giovanni Stradano: The Siege of Florence, Palazzo Vecchio, Sala di Clemente VII.